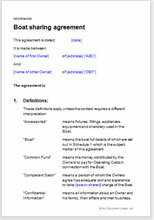 This boat share agreement covers any situation where people share ownership and use. This agreement covers any situation where two or more people or sets of people share ownership and use of a boat for leisure. The agreement has been drawn to as to regulate occupation where only one owner occupies the boat at one time. However, there is nothing to prevent a second owner sharing time with another owner.